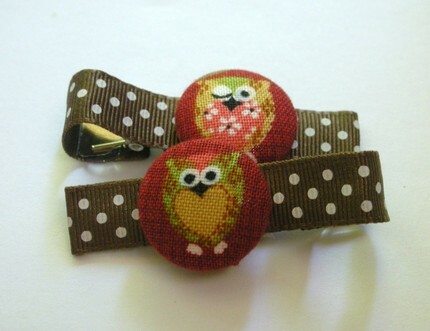 Which just means that I have a reason to shop for baby barrettes, like the cute one she’s wearing, which I am ashamed to say I don’t remember the maker, but I bought it at a craft fair months ago and just love it! And check this one out this this stunner from Pretty in Posies. It might never make it to the Peach’s head, because Mama wants to wear it out! Naughty Mommy! But a beautiful bow still gets my heart. 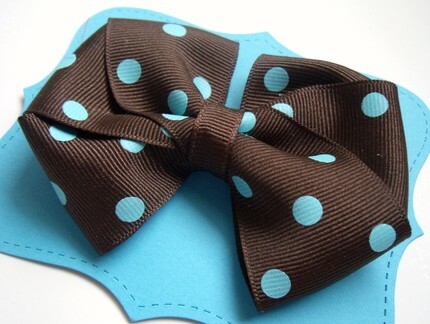 Like this gorgeous brown and turquoise polka dot one from Brown-Eyed Babies. Can’t you just see it in a little girls hair? 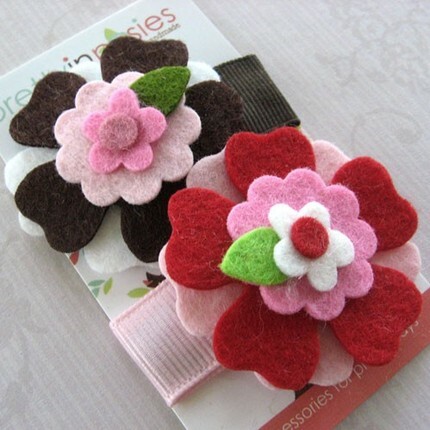 I’m still on the look-out for those old school plastic barrettes that were made of molded plastic of three flowers or a ribbon that I wore in my hair when I was a child. Anyone know the ones I’m talking about? They used to come in a 12 pack. Anyone else remember them? I’d like to introduce a new section to the blog called Kiddie Kouture, because man, there is some great stuff out there for kids that goes way beyond BabyGap. (Not that I’m knocking BabyGap! They are the staples many Moms today rely on.) And hey, I got a kid! And I dress her in vintage duds all the time! And there are some great ways to break out of the ordinary with vintage kiddie clothing and amazing sellers on Etsy that I find and would love to share with ya’ll. But first, let me give a little vintage knitting shout out to Pilgrim who found this amazing book with the hippest knit and crocheted dresses for your above-average mod tween. 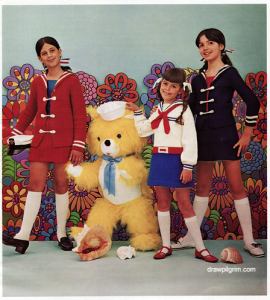 If I walked down the street with a large yellow fake fur teddy bear dodging the odd seashell, I’d wear a spunky sailor inspired crocheted outfit too! Thanks Pilgrim for the great Friday inspiration!